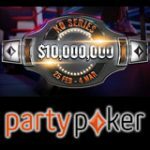 Titan Poker have reduced rake on several table formats in their latest promotion Rake Break tables that was announced after PartyPoker’s no rake Tournaments promotion was launched last week. 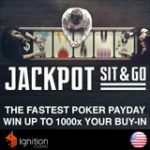 It appears that the two fierce rivals are competing for even higher stakes in trying to capture as many of Full Tilt Poker players after their recent temporary closure. 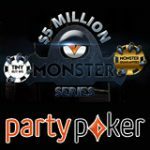 Titan Poker vs. PartyPoker, rivalry has been strong over the years with Titan Poker being the flagship of the iPoker network having lost in the war so far still find themselves about 1000 players short of PartyPoker every day. 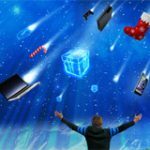 The news comes shortly after Titan Poker just increased their first deposit sign up bonus code to a new 200% up to $2000, Titan Poker seem to pulling out all the stops to try gain momentum on the current unsteady market while picking up Full Tilt’s lost players look for the special Rake Break tables in the Titan Poker software. Titan Poker bonus code: WAP * New bigger 200% up to $2000 TitanPoker quick release first deposit bonus. Titan Poker have launched their rake break where poker cash game players will benefit the most with lowered rake rates and even rake free games for high limit stakes, players will still be awarded points at the regular rate despite the reduced rake rates. Fixed Limit Hold’em Tables will have a 50% discounted rake on all tables all day long. NL Hold’em Tables will have 50% discounted rake on blinds up to 0.05/0.10 all day long. High Stakes NL Hold’em Tables will see no rake at all charged for no limit high stakes tables of $25/$50 and higher all day long instead a set fee of $0.10 for every High Stakes hand will be charged but if the hand does not reach the Flop then a fee will not be deducted from the pot. This promotion is available only at specifically designated cash tables, of 2-6 players. Rake Break will only be available on US Dollar (“$”) tables. The discounted rake at the designated tables will be done by lowering the maximum rake cap by 50%. Points are accumulated based on the final rake (after discount) taken in each hand. Tables that have disconnection protection (DP) are not eligible for this promotion. Rake Break tables will appear under a special tab in the poker software. Titan Poker reserves the right to amend or cancel this promotion at any given time. 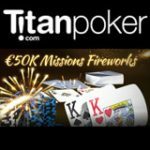 All decisions by Titan Poker are final. 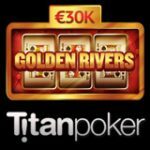 Titan Poker bonus code: WAP * New 200% up to $2000 TitanPoker first deposit bonus, sign up now to enable the bigger Titan Poker bonus July 2011.